How do I get my EZ track power routed switches to perform right? I have a double oval with four switches on each side connecting them. I have only 6 insulated rail joiners on the layout(after showing my track plan to the guy at the local train store). I have the same terminal on each oval but when I try to switch the train into the next oval, it stops. I need help!!!! I want to get my layout up and running. The best answer is the same as Hunt posted in reply to the same question you asked earlier. "Get a copy of The Complete Atlas Wiring Book -- All Scales -- Book # 12. 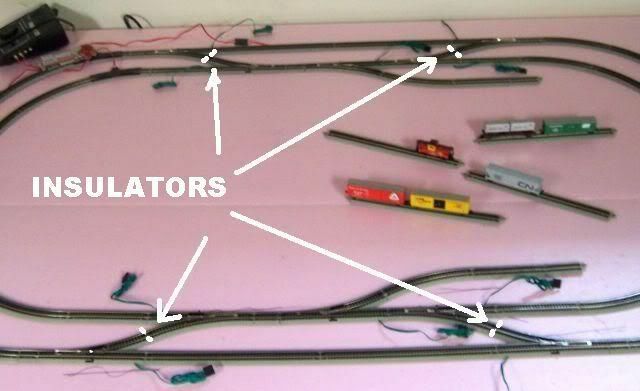 "It has diagrams showing how to connect the two DC power packs to the rails so you do not reverse polarity and where to correctly place insulated rail joiners." Without an accurate diagram of your track plan and how you have it wired, I and anyone else would only be guessing at what is missing or what you have wired or gaped (insulated) wrong. This article, however; does not help you with how and where to place any other rail gaps or connect any other power feeds necessary as required by your track plan. I didn't think that Bachmann makes "Power Routing" turnouts in any scale. "Power Routing" means that electrical power is routed through the rails depending on which route is selected. (straight or diverging). Are you maybe talking about "Powered" turnouts that have a "switch machine" attached so that they can be remotely operated? The icon wasn't meant to infer that I was angry with anyone here, just my own frustration. Here is my layout. I only have 1 insulated rail joiner connecting each switch(on the outside rail). Each oval has a power pack. The trains stops when I try to get it to the inner or outer oval. I hope the pic helps. Thanks again for your input. If you place a loco on the inner oval, will it run? In any case you have to have 2 insulators at each area where the inner and outer ovals meet. You must maintain 2 completely independant electrical circuits. You need a total of 8 insulators and I have marked in white where they should go. The Complete Atlas Wiring Book -- All Scales -- Book # 12, page 30 -- figure 4-14 covers cab control (use of two DC power packs) for a double track layout. You will see you need 4 additional insulated rail joiners, 2 Atlas Selector switches or the like and more power connector wire. Wiring is simpler if you were using DCC instead of Cab Control. "Cab Control" means being able to select which power pack controls which section of track and being able to switch back and forth. It is the best way to allow trains to go from one electrical block to another. But you can operate without it as long as both your power packs are set to the same direction and approximate speed as the loco crosses from one oval to the other. Do you plan to run more than one train? If so you may want to be able to turn off the power to one siding or area of track. This is also done with insulators and a switch to turn on and off the feed to that section of track. In this case you can get away with just insulating one side of the track. Msowsun ball is now in your court. Try msowsun's suggested method of only placing insulated rail joiners on both rails of the turnouts divergent route (per his markings on your layout photo) and let him know what happens as you run two trains. Do you have your trains running yet? Vinny's problem is a real one. I have run into a similar problem with one switch on my layout. EZ Track switches ARE power routing and therefore need insulators at certain points. My train will run fine but if you throw a switch and not have power routing to the rail your train is on it will stop. In every train book I have seen it says if you have a power routing switch you have to insulate it. I currently use one train and one power pack but will need to use insulators in a couple of places to ensure proper power. I went to the train store but no book! I do plan on running two trains,provided I can get this problem fixed. My train does run on either oval. I appreciate everyone's assistance with this issue. I will keep you posted of my progress. Every time I post here, everyone has done a great job of giving me advice. I value your experience with model railroading. One more question: how can I get one train to go in the opposite direction of the other one instead of them both going in the same direction? The problem is that I can't get the train to go into the other oval;it stops when I turn the direction on the switch to go to the other oval. I put the other insulated rail joiners on but I have the same issue(see above). I was hoping I could get this thing running without having to put blocks and controls into my layout. I'm not electrically or mechanically brilliant. I'm so frustrated right now I'm about to just run one train and simplify my layout! I never had this problem with EZ track switches in HO(of course, they weren't power routed).